The AR-15 market in the United States is saturated with just about every kind of accessory you might even think you’d need…everything from lights, bayonets, to even chainsaws. 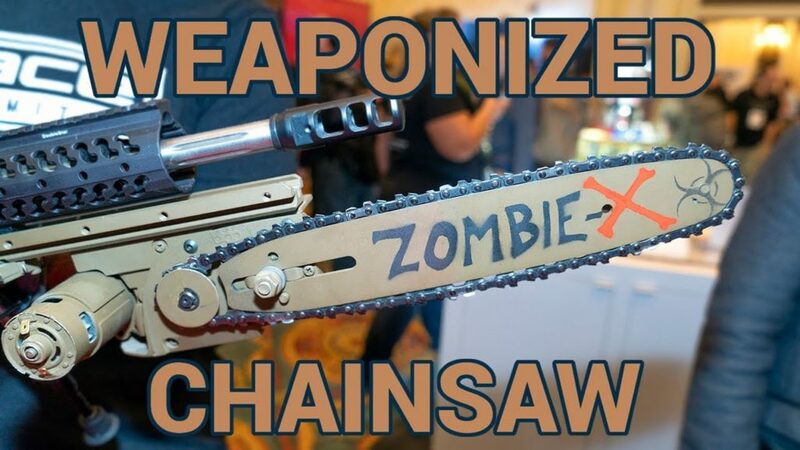 The AR-15 Chainsaw Bayonet – for all your Zombie slaying needs! And tell you about some great ones that are on the market, how to use them, and what they can do for you. What is an AR-15 Foregrip? 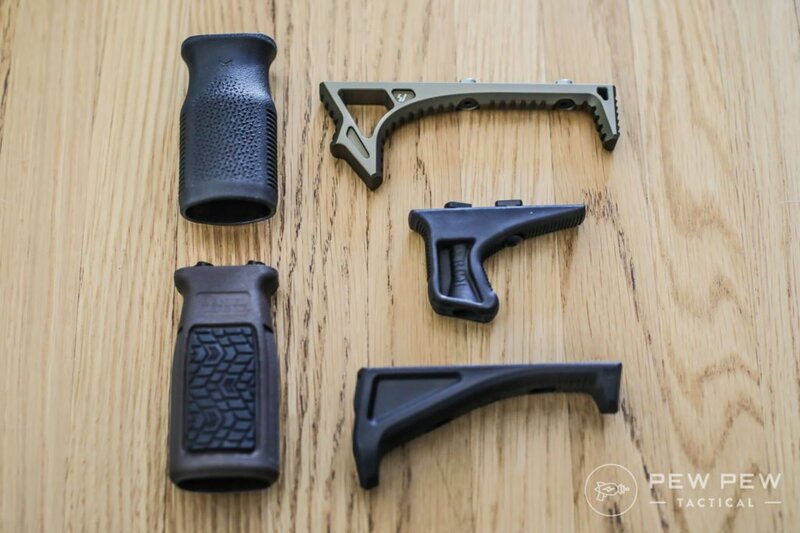 It can actually describe a pretty broad category of devices you add to the handguard in order to offer a different kind of grip. When holding an AR-15, shooters typically hold the handguard under the bottom with their support hand in a cupping grip. However, over the years different objects have been added to these handguards to change the way the support hand merges with the gun. This is often based on the personal preferences of the shooter. The general idea of the foregrip is to help you with recoil control. The AR platform chambered in .223 or 5.56 is not an untamable beast when you pull the trigger. That being said, rapid fire or full-auto variants can make it more difficult to control shot placement. 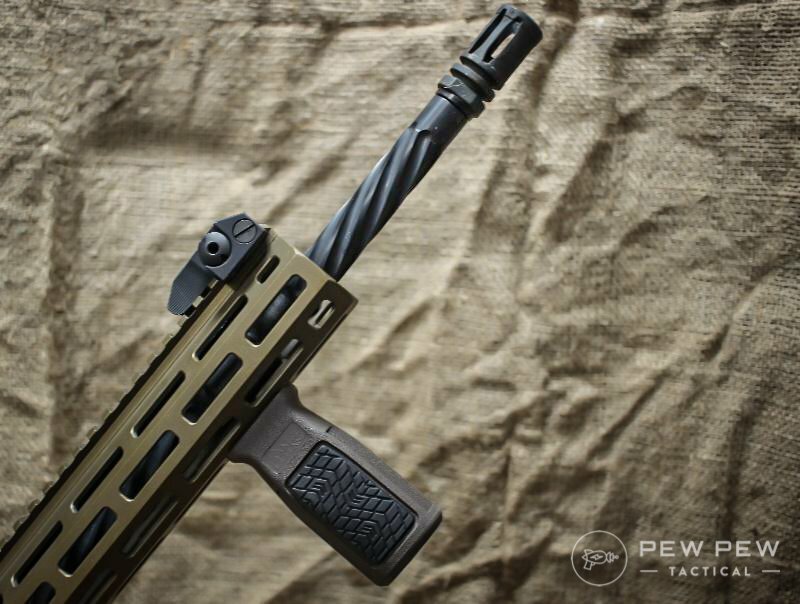 The concept of the foregrip is a handle, offering more resistance to recoil impulse than a round handguard, which allows you to snug the rifle harder into your shoulder. You can also push foregrips into barricades to stabilize shooting positions. In this article, I’m going to cover a few foregrip sub-categories: vertical, horizontal, and special. Vertical foregrips are pretty common and they are essentially a bar mounted to the bottom of the handguard of an AR. Referred to as the “broomstick” in the military, the vertical foregrip has come in a few different variations and they offer some distinct advantages. Horizontal is a category that means the grip typically runs more along the bottom of the handguard, but it still manages to give you more of a grip to pull the rifle into your shoulder. Special grips are exactly that. They may base from one of the above categories but are different enough to warrant a special section of their own. This vertical grip is an excellent choice. Made of polymer, it comes in different colors and will work with Keymod or M-LOK so you can pick the one that works best for your rifle. A prime example of the vertical foregrip, it is shaped to fit the hand with rounded edges and flat sides. It’s 3.25 inches tall and 2 inches wide, so it fits most hands. Shooters with larger mitts will feel like their hand is hanging off a bit but they will still have good purchase. 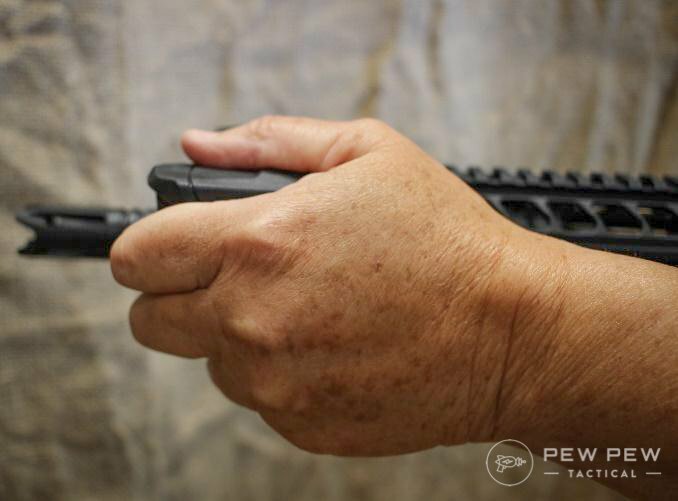 This grip points straight down and allows the shooter to grab it and pull the rifle into the shoulder more firmly. In the next photo you can see a variant of the traditional broomstick grip, more of a ¾ grip where the bottom of the handguard is still used, but the grip provides resistance to the rear. Shooters using this grip will notice a difference in controlling the recoil impulse. A sight picture is typically not that tough to reacquire when using the grip to pull the buttstock into your shoulder. 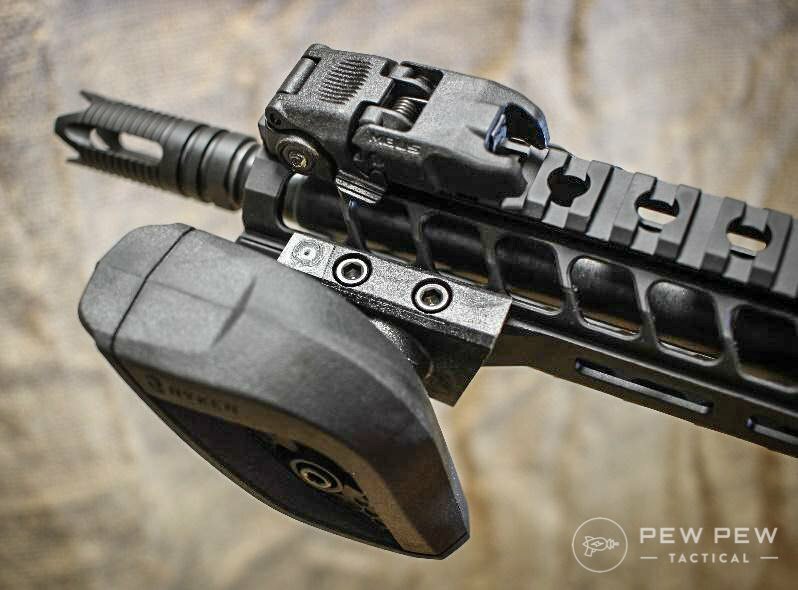 In addition, it changes the ergonomics of the support arm causing a bit less strain on the wrist than a traditional cupping grip on the handguard. The Magpul version of the vertical grip is very similar to the Daniel Defense, though a bit more rounded. It too is made of polymer, comes in a variety of colors and can mount right up to your rail. In the photo above, the grip is mounted to the end of the rail because the rail is shorter on the LWRC rifle being used. Where you mount the grip can dictate how you hold it. In this case, you are limited to a full fist grip (below). This can be changed with the amount of real estate you have on your handguard. The MVG is similar in almost all ways to the Daniel Defense grip though I noticed the M-LOK hardware was a bit beefier and the price is much less. Shooters using this old broomstick style hold have to be careful that they are pulling directly back into the shoulder, otherwise shot placement can suffer. I enjoy shooting with a vertical foregrip, though I do not use the traditional broomstick shooting style. Both of these grips are great choices for long shooting days (training) if you don’t have a sling as they held you distribute the weight of the rifle while you are in low ready, or just resting the weapon muzzle down. Another variety of the foregrip is horizontal or angled grips. Serving the same purpose, these grips are a bit more stretched out but still offer the same advantages of the vertical grips in different ways. 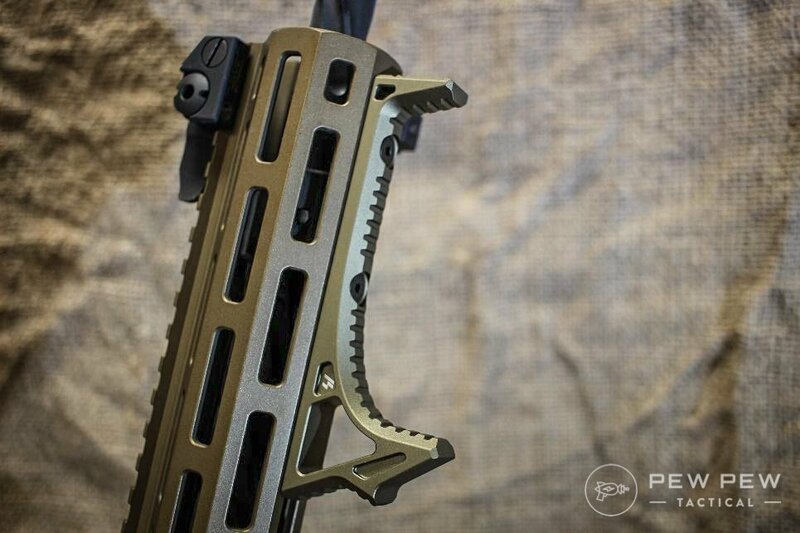 The AFG is another great polymer option from Magpul that answers the same riddle with a different approach. 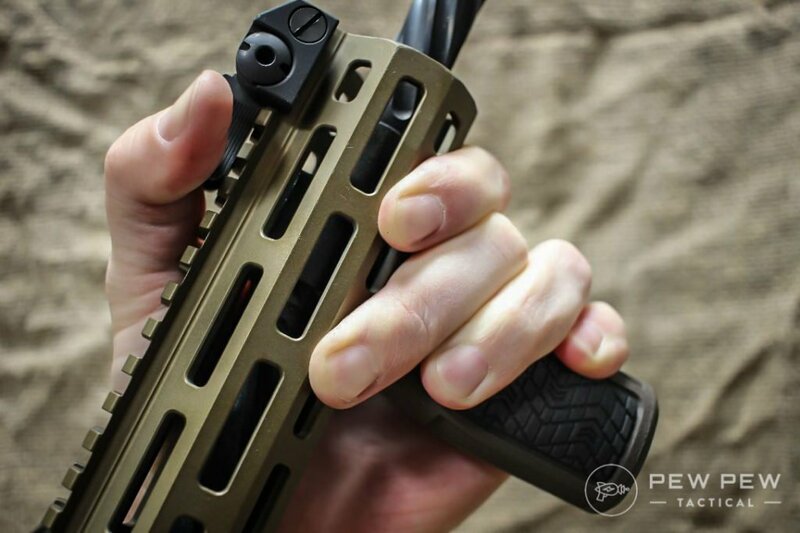 Shooters will note the same traditional grip on the bottom of the handguard, though it angles the hand down a bit. This subtle change makes the wrist bend slightly less, creating a more ergonomic placement. The front bumper can be jammed into barricades as a stabilization point for that type of shooting as well. This grip is a great value and comes in different styles with as many as five different colors. What’s your take on the AFG? The SI Curved Foregrip is a great choice for those who like a more traditional grip position for the support hand. The bumpers cup the hand really well and allow the gun to be driven forward as well as pulled back into the shoulder. The inside of the foregrip is serrated and allows for great retention. 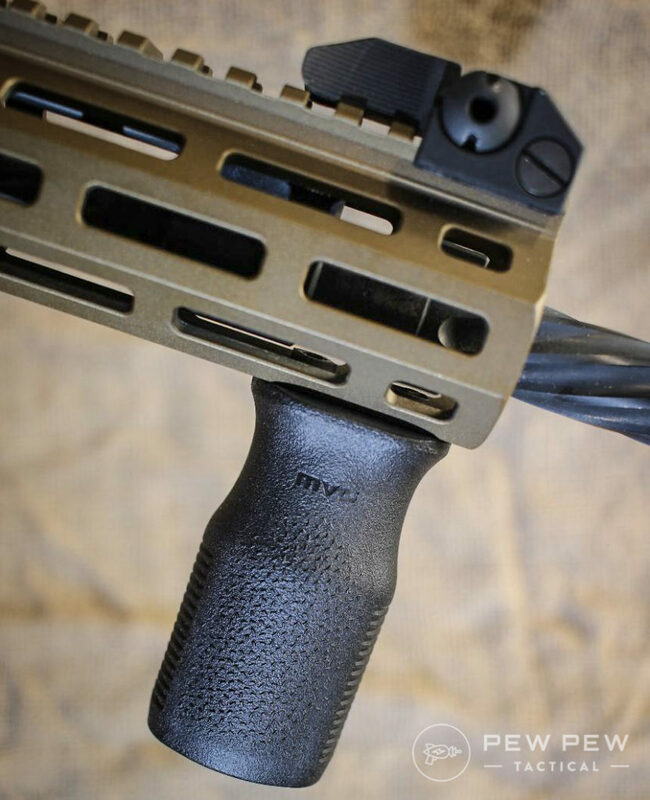 Strike Industries is known for some cool innovations and this foregrip does not disappoint. It comes with the LINK system which allows it to be mounted to either M-LOK or Keymod. Made out of coated aluminum, the Link is tough and very lightweight. At least a couple of products currently on the market defy specific categorization because of their approach to accomplishing the same mission of the foregrip. The Ryker Grip represents a complete departure from the traditional methodology. The developers at Ryker studied the body mechanics of shooting and moving a rifle. They then created a product that has a lot of shooters scratching their head—until they try it. The guys at Ryker have some interesting military backgrounds and they have done some testing with active duty military who have given them feedback. 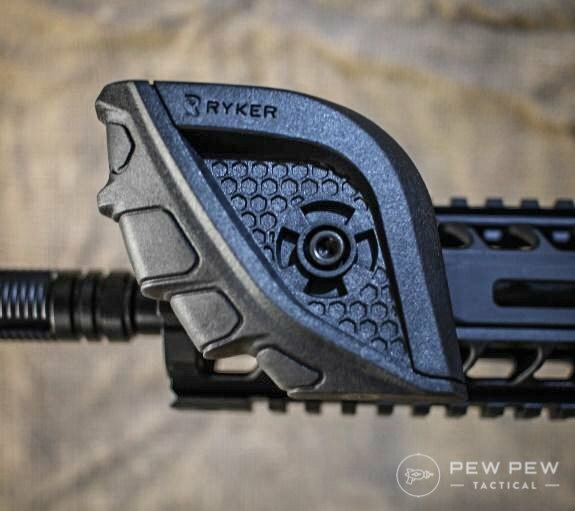 Also, the National Tactical Officers Association (NTOA) recently gave the thumbs up to the Ryker Grip so even though it looks totally different, some serious shooters have given it the nod. The basic concept is that it serves as an ergonomic grip which mounts on the side of the rifle. This places the thumb up, and palm in, toward the rifle. Having used this unorthodox grip, I can tell you it removes a lot of the binding that happens in the wrist and forearm. Shooters can drive the gun with surprisingly better accuracy and speed. The Ryker is made of polymer and is tough. It currently must mount on a side Picatinny rail, sadly that limits what handguards can use it. It is reversible so lefties need not despair. The 360 VFG (vertical foregrip) is a great evolution of the traditional broomstick. The unit mounts to your rail like a standard grip, but that’s where the similarities end. With a twist of the bottom portion of the shaft, the upper portion loosens and can rotate. You can curve the 360 VFG back, forward, and even out to the side. You can hit just about any angle as it rotates on a ball pivot at the base. Once you have it in the position you like, simply tighten the end and it locks into place. The whole unit is made of aluminum, weighs 5.2 ounces and measures 3 7/8 inches long. The end of the grip can unscrew exposing the hollow handle for battery storage. It comes in four colors and is available for Picatinny, Keymod, and M-LOK! 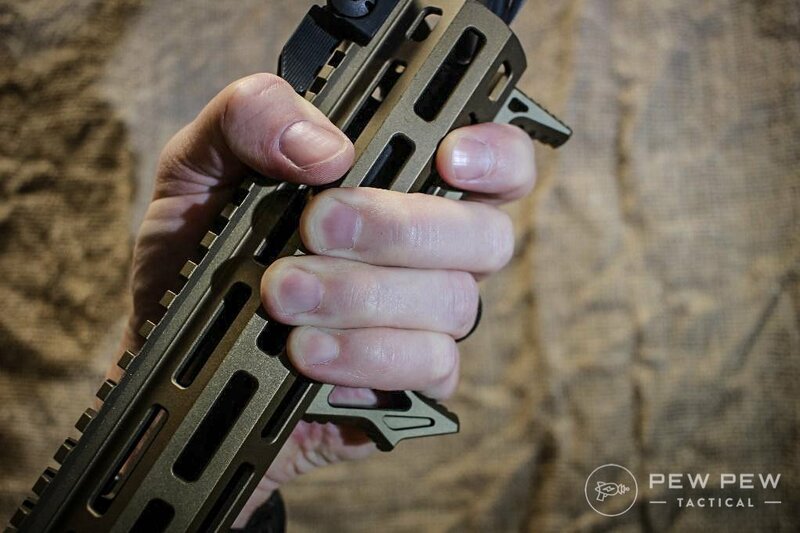 Developed by BCM in conjunction with Travis Haley (Haley Strategic Partners), the Kinesthetic Angled Grip is a minimalist approach that brings maximum results. The KAG reminds me of a comma and it is every bit as useful. 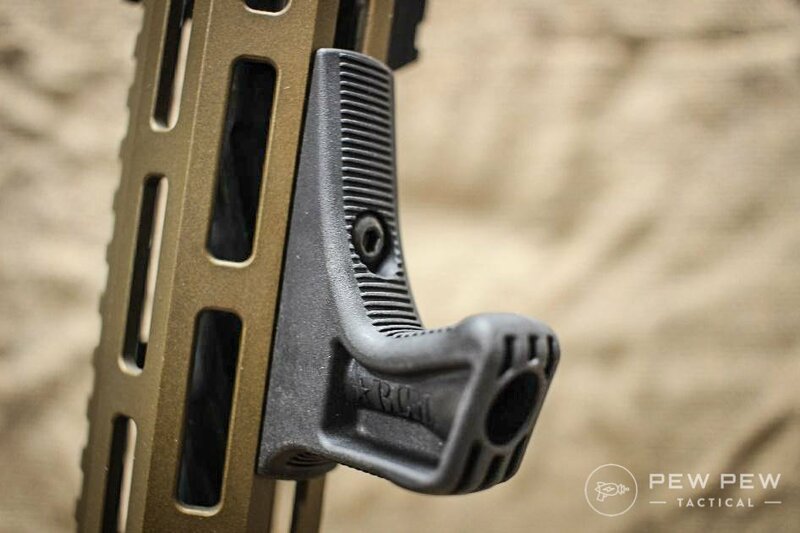 This small grip has a foot firmly planted in the horizontal and vertical foregrip worlds. 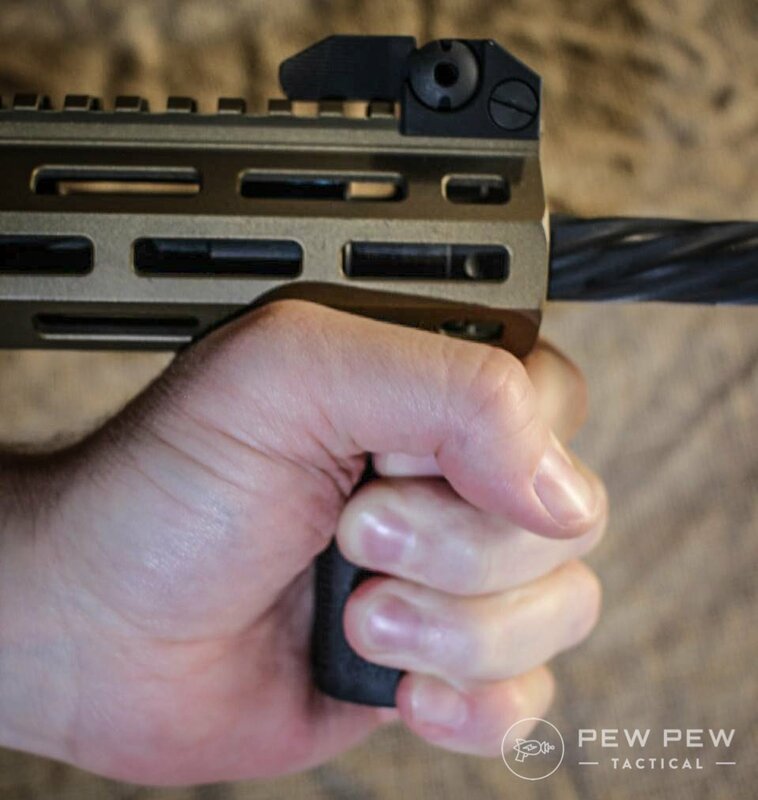 Mounted on the bottom of your handguard, the KAG serves as a great reference point for the back of your hand. It is so small, you hardly notice its presence but it is extremely comfortable. It cups the back of your hand and also angles it down slightly, releasing some of the binding that happens in the joints when you raise a file. Despite its small size, it holds enough of your hand to allow you good backpressure, pulling the rifle snugly into your shoulder. With the KAG you can shoot a traditional support grip (albeit more ergonomic) or a thumb-over-bore. The KAG comes any color you want, as long as that color is black. 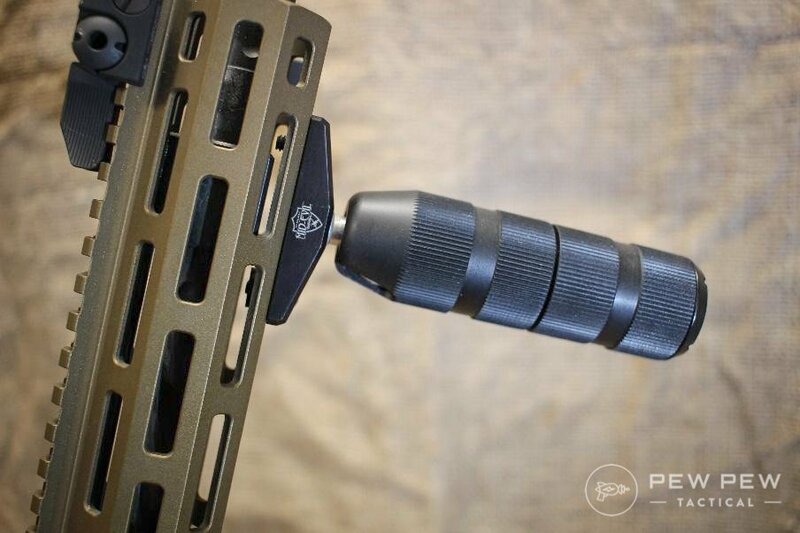 There are so many great options out there when it comes to mounting a foregrip to your handguard. Keep in mind, most of these evolved from the military—people who carry their rifles for hours on end, people who patrol with them, people who shoot their rifles until they need a new barrel. There is no beard-oil, tacticool in these products. They are made with a purpose. Ultimately, you have to decide which will work best for you and the only way to truly know that is to try them. I have used all the above products and find them to be excellent. Depending on your use of your rifle, you may find one that is a great fit for you too. Regardless, if you get one and like it, you need to train with it! 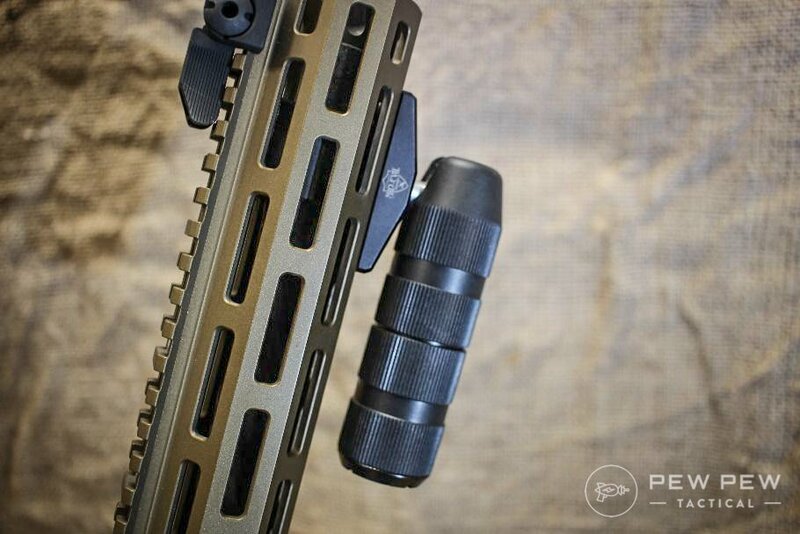 Once you have a foregrip – you’ll want to grab some other upgrades for your rifle! 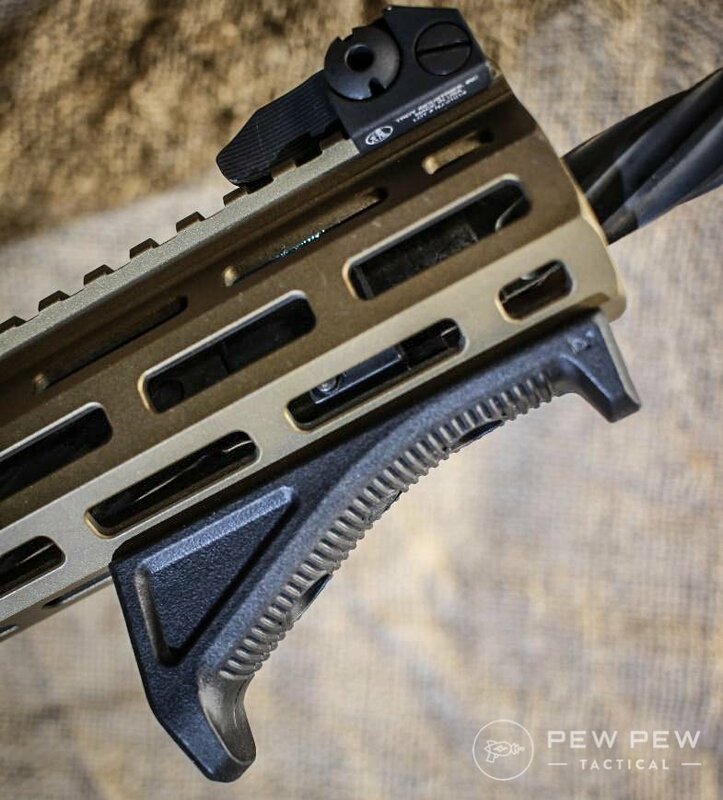 So…what is your favorite foregrip? Tell us about it in the comments! Where should i put a Magpul broomhandle grip on a SBR with 11.5 inch barrel with Magpul front cover? In the middle or front of grip? Thanks. Paul, I’m not sure what you mean by front cover. With that short a barrel, I’d place it as close to the muzzle as you can get without risking your fingers. That’s going to give you the best muzzle control and maneuverability. If this doesn’t answer your question, give me some more details. Okay that makes sense. Placement depends on grip. 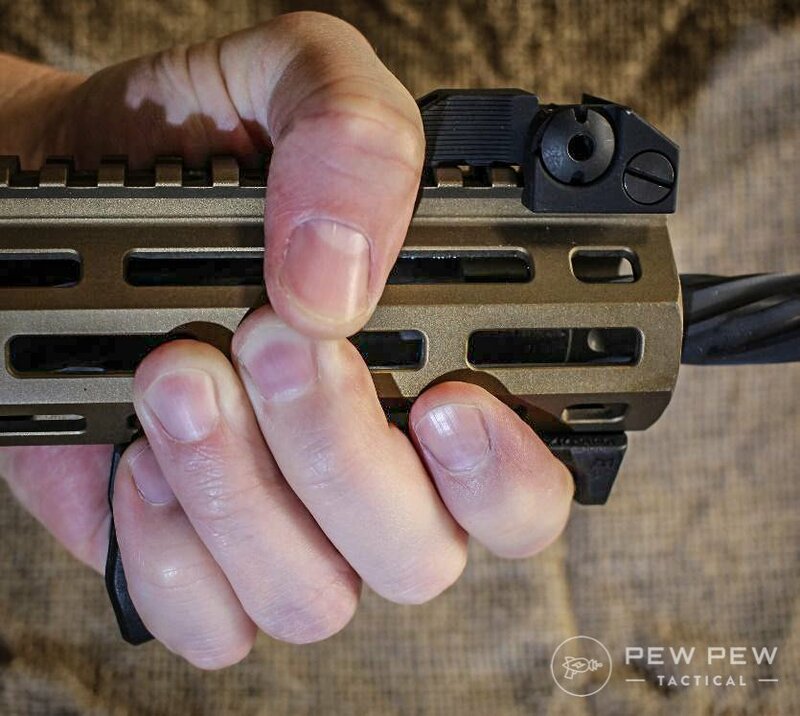 If you’re grabbing the fore grip fully with your support hand you can go as far forward as you dare. Most rails will stop short of muzzle blast risk. 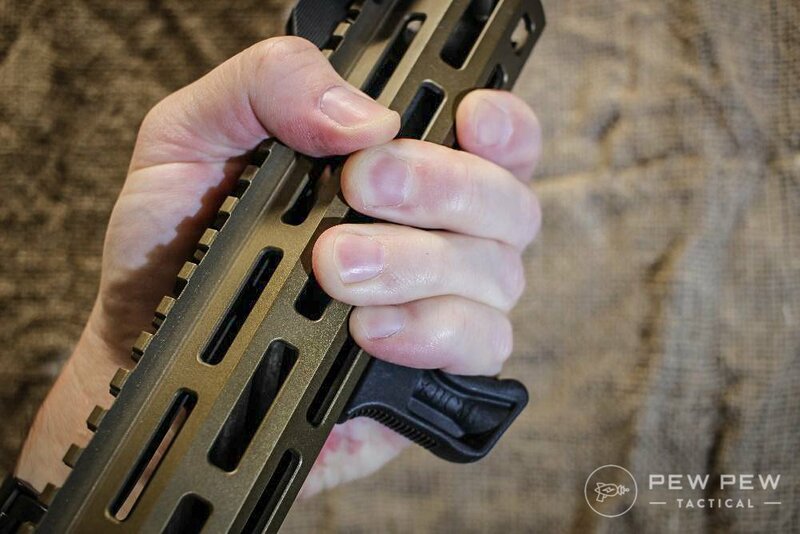 If you place your hand in front of the fore grip, like in the second image of the Daniel Defense grip above, you may want to scoot it back a smidge. Cite as: Cal. Penal Code §12276.1. It seems if you have a detachable magazine, adding a “forward pistol grip” turns your rifle into an “assault rifle”. I operate my AR15 one handed, therefore I do not have to worry about a foregrip. Marcia, if the time for confiscation does come I’m not gonna be worried about what grip is on my rail. In fact I’m not gonna be worried about anything but me, my family and my close circle of former teammates who all will be right behind me.